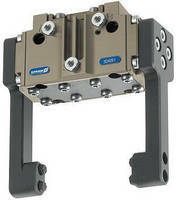 The successful DPGplus series of sealed 2-finger parallel grippers has been extended with sizes 240 and 300. The pneumatic drive with oval pistons and the multi-tooth guides ensure the user precise and reliable gripping. This ensures a high level of machine up time and high returns from your production and assembly applications. The DPGplus sealed 2-finger parallel gripper is an expert at handling rough or dirty workpieces. It is perfectly suited for loading and unloading in harsh environments, like grinding machines, lathes, and milling machines. It is also suitable for use in painting systems, powder coating systems, or underwater. The sealed grippers of the DPG-plus series feature sealing class IP 67 for the highest sealing in its class, with moments between 30 Nm and 160 Nm, (22 Ft-lb-118 Ft-lb) depending on the direction of load and size of the unit and grip forces up to 11,700 N (2,630 lbf). The high sealing class and performance are made possible by combining a multi-tooth guide with a round sealing surface of the base jaws toward the outside.